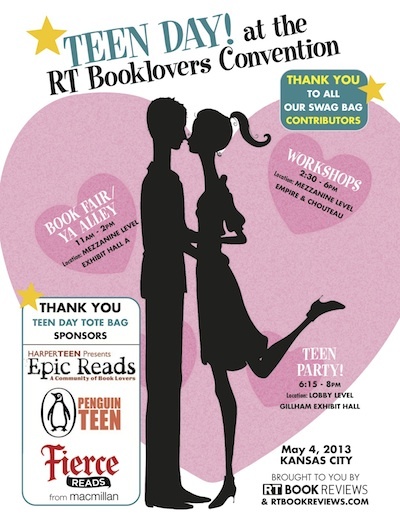 If you’ve never heard of Teen Day at the Romantic Times Booklovers Convention, let me fill you in. 100 amazing YA authors + me + 1 big room = 3 hours of delicious pandemonium called YA Alley. Get autographs from luminaries such as Jennifer Brown, Veronica Roth, Kim Derting, Ally Carter, Carrie Ryan, Aprilynne Pike, Maureen Johnson, and Stephanie Perkins. I, personally, will be sitting next to Sarah Rees Brennan trying not to faint from fan-girl overload. I’m on a speed reading panel between 5 and 6pm, and afterwards plan to “unwind” at the Teen Party, where you can win books and swag by the toteful. Hope to see you there!